To Cite: Ishida H, Suehiro T, Watanabe S. Electromyographic Activities of Cervical Muscles While Using an Oscillating Blade Held in the Mouth: Influence of Different Swings, Middle East J Rehabil Health Stud. Online ahead of Print ; 6(1):e85546. doi: 10.5812/mejrh.85546. Background: Neck pain is one of the most prevalent musculoskeletal conditions. Manual mobilization plus exercise are recommended for treating people with acute neck pain with movement coordination impairments. Therefore, it is important to consider a safe and effective coordination exercise for the cervical muscles. Using an oscillating device by holding it in the mouth might be a type of coordination exercise for the cervical muscles. Objectives: This study aimed to compare the activities of the cervical muscles while using an oscillating blade held in the mouth with different swings. Methods: Ten healthy male university students participated in this study (20.8 ± 0.9 years). The activities of the sternocleidomastoid and cervical extensor muscles were measured using electromyography while using an oscillating blade held in the mouth in horizontal orientation (up-down oscillation). Participants were asked to oscillate the device in one of the following swings: Cervical flexion-extension and knee flexion-extension. Both exercises were performed in a standing position. All EMG activities were normalized by EMG activities during maximum voluntary contractions of those muscles. Results: The activities of the sternocleidomastoid with knee flexion-extension (5.7 ± 4.8 %) present significantly lower muscle activities (P = 0.011) than those with cervical flexion-extension (12.2 ± 8.6%). The activities of the cervical extensor muscles with knee flexion-extension (10.7 ± 6.5%) present significantly lower muscle activities (P < 0.001) than those with cervical flexion-extension (17.5 ± 10.3%). Conclusions: The results of this study indicated that the exercise with knee flexion-extension had lower load for the cervical muscles than that with cervical flexionextension. The findings of this study could be basic information for grading intensity of cervical coordination exercise using an oscillating blade held in the mouth. Neck pain is one of the most prevalent musculoskeletal conditions (1). Manual mobilization techniques plus exercise are recommended for treating people with acute neck pain with movement coordination impairments (2). Neuro muscular changes in response to training are specific to the mode of the exercise performed. Therefore, it is important to consider a safe and effective coordination exercise for the cervical muscles. The activities of the limb and trunk muscles during the use of an oscillating device held in 1 or 2 hands were previously analyzed (3-10), and the device has been used for rotator cuff muscle strengthening and trunk stabilizing exercise. The oscillating device may be designed to induce the user’s muscle rapid recruitment or decruitment (5). Therefore, using an oscillating device by holding it in the mouth might be a type of coordination exercise for the cervical muscles. To estimate individual muscle activities by observing human movements is impossible. Electromyography (EMG) could be used to measure the electrical muscle activity levels. Quantitative data, normalized with respect to maximal voluntary contractions (MVC), are required to select the most appropriate intensity of coordination exercise for the cervical muscles. A previous study classified muscle activity of 0% to 20% of the MVC (%) as “low”, 21 to 40% as “moderate”, 41 to 60% as “high”, and greater than 60% as “very high” (11). Additionally, a muscle activity of more than 40% - 60% indicates a muscle strengthening stimulus (12). To obtain a muscle endurance capacity or to maintain stability is less than 25% (12). However, there is no study about the activities of the cervical muscles while using an oscillating blade held in the mouth. To achieve up-down oscillation of an oscillating device held in the mouth in a horizontal orientation, swings used would be cervical flexion-extension or knee flexion-extension in the standing positon. This study aimed to compare the activities of the cervical muscles while using an oscillating blade held in the mouth with different swings. Ten healthy male physiotherapy students of the Kawasaki University of Medical Welfare were recruited through advertisements. The mean (± standard deviation) age, height, and weight of the subjects were 20.8 ± 0.9 years, 165.8 ± 5.2 cm, and 65.1 ± 12.3 kg, respectively. Participants were excluded if they had neck pain over the previous year, a history of orthopedic disorders affecting the neck or neurological disorders. This study was conducted with approval of the Research Ethics Committee at Kawasaki University of Medical Welfare (#18-023). Written informed consent was obtained from all subjects. The protocol for this study is consistent with the ethical guidelines of the 1975 Declaration of Helsinki. EMG were recorded using disposable surface electrodes (Blue Sensor P-00-S; Mets Co. Ltd., Tokyo, Japan). Bipolar electrode pairs were placed longitudinally over the muscle at 2.5-cm intervals. A grounded electrode was placed over the right collarbone. EMG were recorded from the right sternocleidomastoid muscle midway between the mastoid process and manubrium of the sternum and from the C4 cervical extensor muscles 2 cm lateral to the C4 spinous process using an EMG system (MyoSystem 1200; Noraxon Inc., AZ, USA). The EMG signals were band-pass filtered (10 - 500 Hz) and stored at a sampling frequency of 1000 Hz. 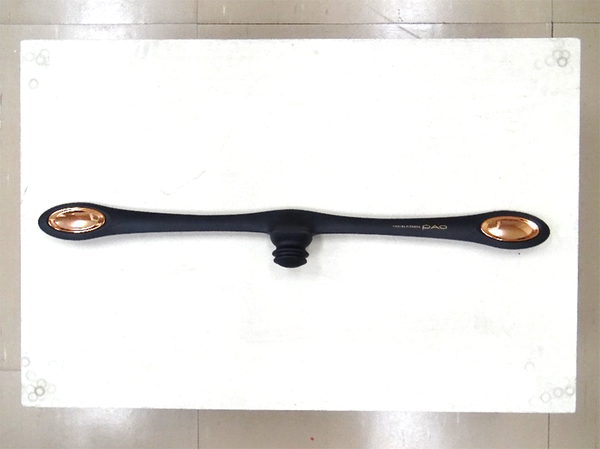 An oscillating blade (Facial Fitness PAO; MTG Co. Ltd., Aichi, Japan) is a flexible polyurethane with a natural frequency of 2 - 3 Hz (width, 540 mm; depth, 65 mm; height, 35 mm; and weight, 1.7 N) (Figure 1). The activities of the sternocleidomastoid and C4 cervical extensor muscles were measured for 5 s while using the oscillating blade held in the mouth in horizontal orientation (up-down oscillation) (Figure 2). After a brief instruction and practice session, participants were tasked to oscillate the blade over a 15-s period in one of the following swings: Cervical flexion-extension and knee flexion-extension. Both tasks were performed in a standing position. Participants were also asked to keep the amplitude of the outer blade at the height of the eyebrows when the outer blade rises remarkably during oscillation. 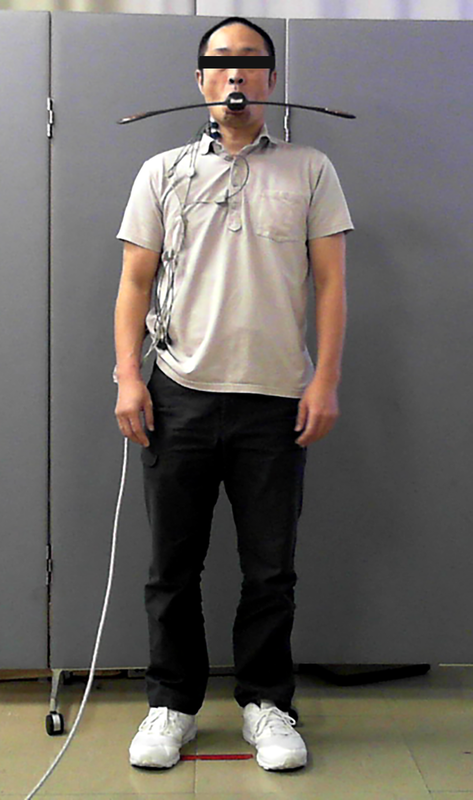 During the practice and recording, visual feedback was obtained from the participant using a mirror that was positioned 1.5 m away from the participant’s face. Verbal instructions for cervical flexion-extension and knee flexion-extension tasks were “use your cervical flexion-extension in achieving oscillation” and “isometrically hold your cervical joints and use your knee flexion-extension in achieving oscillation,” respectively. The order of the tasks was randomized. Data were collected two times for each task. The average EMG values during the task were normalized relative to the MVC (%), which was obtained in the isometric maximal exertion tasks, using a standard manual muscle test described by Hislop et al. (13). The MVC was held for 5 s and the average EMG values were used. were calculated (14). The paired t-test was used to examine the significance of differences between swings. P values < 0.05 were considered statistically significant. The G-Power software (Franz Faul, University Kiel, Germany) was also used to calculate the post-hoc effect size and the actual power of the sample. The reliability of the measured values is listed in Table 1. Both muscles in knee flexion-extension present significantly low muscle activities compared to those in cervical flexion-extension (Table 2). Abbreviations: ICC, intraclass correlation coefficient; MDC, minimal detectable change; SEM, standard error of measurement. This study quantified the activities of the sternocleidomastoid and cervical extensor muscles while using the oscillating blade held in the mouth. In the both tasks, motion in the participant’s neck must be minimized to achieve oscillation at its natural frequency; excessive neck movement interferes with coordination necessary to isolate reciprocal motion to the head (5, 7), and coordinately induced “low” muscle activity of the sternocleidomastoid and cervical extensor muscles (11). The intensity of both cervical muscles may be suitable in providing endurance and stability (12). The activities of the sternocleidomastoid and cervical extensor muscles in knee flexion-extension were lower than those in cervical flexion-extension. The difference in both cervical muscle activities between knee flexion-extension and cervical flexion-extension would be related to differences in the swings. The task with cervical flexion-extension needed the cyclic activities of the both cervical muscles to move cervical joints to generate the movement. In contrast, the task with knee flexion-extension needed the cyclic activities of both cervical muscles to hold cervical joints to transfer the movement of knee flexion-extension. The difference between moving and holding the cervical joints would appear to be the difference in the both cervical muscle activities. Our participants were healthy, thereby limiting the generalization of our findings to individuals with reduced neck muscle performance. Additional research must be conducted in populations with neck pain to increase the clinical applicability of our findings. Before data collection, the subjects were trained by the same investigator to perform the tasks. However, we did not record oscillation of the blade during the tasks. Thus, we cannot claim that the oscillation of the blade was uniform across the subjects. The results of this study indicated that the task with knee flexion-extension had lower load for the cervical muscles than that with cervical flexion-extension. The findings of this study could be basic information for grading intensity of cervical coordination exercise using an oscillating blade held in the mouth. Ethical Considerations: This study was conducted with approval of the Research Ethics Committee at Kawasaki University of Medical Welfare (#18-023). 1. Carroll LJ, Hogg-Johnson S, van der Velde G, Haldeman S, Holm LW, Carragee EJ, et al. Course and prognostic factors for neck pain in the general population: Results of the bone and joint decade 2000-2010 task force on neck pain and its associated disorders. J Manipulative Physiol Ther. 2009;32(2 Suppl):S87-96. doi: 10.1016/j.jmpt.2008.11.013. [PubMed: 19251079]. 2. Blanpied PR, Gross AR, Elliott JM, Devaney LL, Clewley D, Walton DM, et al. Neck pain: Revision 2017. J Orthop Sports Phys Ther. 2017;47(7):A1-A83. doi: 10.2519/jospt.2017.0302. [PubMed: 28666405]. 3. Sugimoto D, Blanpied P. Flexible foil exercise and shoulder internal and external rotation strength. J Athl Train. 2006;41(3):280-5. [PubMed: 17043696]. [PubMed Central: PMC1569560]. 4. Lister JL, Del Rossi G, Ma F, Stoutenberg M, Adams JB, Tobkin S, et al. Scapular stabilizer activity during Bodyblade, cuff weights, and Thera-Band use. J Sport Rehabil. 2007;16(1):50-67. [PubMed: 17699887]. 5. Moreside JM, Vera-Garcia FJ, McGill SM. Trunk muscle activation patterns, lumbar compressive forces, and spine stability when using the bodyblade. Phys Ther. 2007;87(2):153-63. doi: 10.2522/ptj.20060019. [PubMed: 17244696]. 6. Anders C, Wenzel B, Scholle HC. Activation characteristics of trunk muscles during cyclic upper-body perturbations caused by an oscillating pole. Arch Phys Med Rehabil. 2008;89(7):1314-22. doi: 10.1016/j.apmr.2007.11.047. [PubMed: 18586133]. 7. Sanchez-Zuriaga D, Vera-Garcia FJ, Moreside JM, McGill SM. Trunk muscle activation patterns and spine kinematics when using an oscillating blade: Influence of different postures and blade orientations. Arch Phys Med Rehabil. 2009;90(6):1055-60. doi: 10.1016/j.apmr.2008.12.015. [PubMed: 19480884]. 8. Parry JS, Straub R, Cipriani DJ. Shoulder- and back-muscle activation during shoulder abduction and flexion using a Bodyblade Pro versus dumbbells. J Sport Rehabil. 2012;21(3):266-72. [PubMed: 22713233]. 9. Oliver GD, Sola M, Dougherty C, Huddleston S. Quantitative examination of upper and lower extremity muscle activation during common shoulder rehabilitation exercises using the Bodyblade. J Strength Cond Res. 2013;27(9):2509-17. doi: 10.1519/JSC.0b013e31827fd4c2. [PubMed: 23238096]. 10. Arora S, Button DC, Basset FA, Behm DG. The effect of double versus single oscillating exercise devices on trunk and limb muscle activation. Int J Sports Phys Ther. 2013;8(4):370-80. [PubMed: 24175124]. [PubMed Central: PMC3812839]. 11. Escamilla RF, Lewis C, Bell D, Bramblet G, Daffron J, Lambert S, et al. Core muscle activation during Swiss ball and traditional abdominal exercises. J Orthop Sports Phys Ther. 2010;40(5):265-76. doi: 10.2519/jospt.2010.3073. [PubMed: 20436242]. 12. Andersen LL, Magnusson SP, Nielsen M, Haleem J, Poulsen K, Aagaard P. Neuromuscular activation in conventional therapeutic exercises and heavy resistance exercises: Implications for rehabilitation. Phys Ther. 2006;86(5):683-97. [PubMed: 16649892]. 13. Hislop HJ, Montgomery J, Connolly BH, Daniels L. Daniels and worthingham's muscle testing: Techniques of manual examination. 6th ed. Philadelphia: W.B. Saunders; 1995. 14. Weir JP. Quantifying test-retest reliability using the intraclass correlation coefficient and the SEM. J Strength Cond Res. 2005;19(1):231-40. doi: 10.1519/15184.1. [PubMed: 15705040].